Your enquiry has been sent to Robert Welsh and they will be in touch directly within the next few days. London based mobile personal trainer, helping clients reach their personal fitness and lifestyle goals. 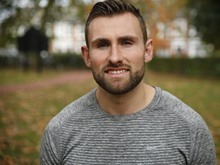 My name is Robert and I am a London based qualified personal trainer with a strong belief in finding a unique approach for each client that comes to me for help. I was born in Sunderland and spent most of my youth working in a dark, depressing factory. I decided one day that my life was worth so much more and moved to London to follow a passion of healthy living, both mentally and physically. I am now pleased to say that the factory life is a distant memory and I now spend my days helping clients achieve their own goals. It is my aim to help others feel as energetic and full of life as I do now, and to show people that, with the right tools, permanent changes can be made for the better! I am a believer in fitness being a lifestyle, but a totally achievable one that doesn't entail eating kale for 3 meals a day. I look to build programmes around what my clients enjoy and what challenges them (because nothing feels better than overcoming a challenge and moving onto the next - trust me!). With so many fad diets and crazy training programmes it can be extremely difficult to differentiate between the good, the bad and the dangerous! I am a firm believer in keeping your programmes easy to follow, flexible and, with some lifestyle changes, totally achievable. Ever since leaving school (10 years ago! ), exercise has never formed a consistent part of my life. Other than the occasional round of golf or 5-a-side football match my lifestyle has been pretty inactive. My weight also tended to yo-yo - trying different diets for 3-4 months and then giving up. I decided to seek some help integrating exercise and healthier eating habits that would be sustainable into my life. Lacking in self- motivation and having not used my gym membership in over a year I thought the best route was via a personal trainer. I was nervous about this - I imagined someone built like Arnold Schwarzenegger shouting at me like an army officer whilst I sweated, cried and vomited through an hour-long session - a session that I thought I would end up dreading and, also, ultimately giving up. However, I was completely wrong! Rob is the nicest, warmest and most encouraging person I've met. We do 2 sessions a week with one another which combine a diverse array of strength and conditioning exercises with cardio. I actually look forward to them! We talked beforehand about what I wanted to achieve and how we could do that together. He sent me some great nutritional information and home programs to compliment our sessions and the motivational texts and positive feedback from him really makes me feel great. I have been having sessions now for a little over a month. Others have noticed a physical change in me and I'm beginning too as well. Mentally, I feel fantastic and it's the best money I've ever spent! It's difficult to put into words how much Rob has improved not only my fitness and health but also my quality of life. I came to him overweight, tired and depressed at my inabilty to stick to a diet and a work out routine that suited me. Rob was so patient with me and took so much time and effort to find a plan that suited ME! A year down the line and I am a totally different person. I am happy, confident and full of life! I am still allowed a glass of wine when I want but I also fit into that red dress that hadnt fasted for years! Thank you Rob for showing me that this is all about small changes that last a lifetime, and for never making me do a burpee ever again! I was sugested Rob through a friend and have never looked back (except occasionally at old photos to see how far I have come). Rob brought an element of fun to all our workouts as thats what was important to me. I wanted to forget I was working out and let the hour be up! Now I want it to last as long as possible and I even do an extra session with my Mum every week.